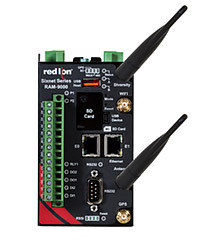 York, Pa. – April 5, 2016 – Red Lion Controls, the global experts in communication, monitoring and control for industrial automation and networking, today announced its Sixnet® series RAM® 9000 industrial cellular RTUs have received ATEX zone 2, category 3 approval and are safe for use in potentially hazardous environments. This approval follows recent announcements that Red Lion’s rugged RAM industrial cellular RTUs support high-speed 4G LTE worldwide throughout the Americas, Europe and Asia Pacific. For more information about Red Lion’s RAM 9000 industrial cellular RTUs, including a complete list of features, please visit www.redlion.net/RAM9000.